Base class for edge iterators. This isn't normally used directly by users except for its public methods inherited by subclasses. Definition at line 731 of file Graph.h. Definition at line 754 of file Graph.h. Causes this iterator to advance to the next node of the edge list. This method should not be invoked on an iterator that points to the end of the list. Definition at line 767 of file Graph.h. Definition at line 775 of file Graph.h. 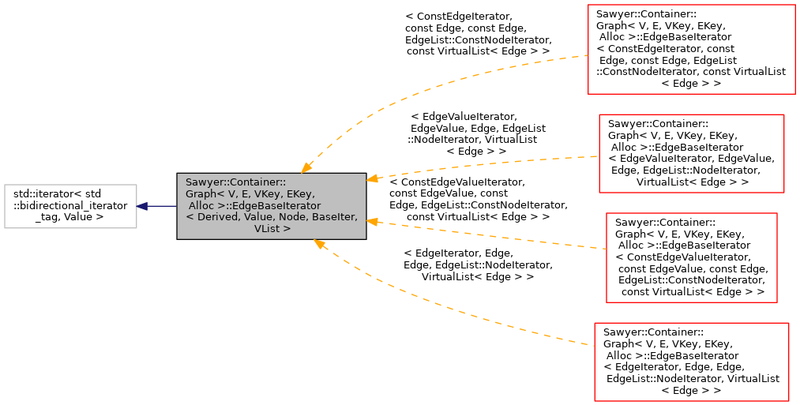 Causes this iterator to advance to the previous node of the edge list. This method should not be invoked on an iterator that points to the beginning of the list. Definition at line 788 of file Graph.h. Definition at line 796 of file Graph.h. Two iterators are equal if they point to the same node of an edge list, and unequal otherwise. 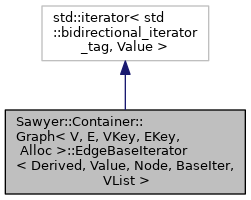 End iterators point to a virtual node one past the end of the list and are unique to each list or sublist. One minor exception to this rule is that end iterators for the in-edge list and out-edge list of the same vertex are considered to be equal. Definition at line 811 of file Graph.h. Definition at line 827 of file Graph.h. Definition at line 833 of file Graph.h. True if iterator doesn't point to anything. Definition at line 850 of file Graph.h.